The ML07 Series is RMT base Series for telecom applications. The Series consists of single-stage thermoelectric coolers with classical telecom shapes. ML07 Series is developed mainly for tunable laser diodes in industry standard “Butterfly“ package form factor. Thermoelectric coolers are available on standard 0.5mm ceramics (Al2O3 or AlN) and thin 0.25mm ceramics. All ML07 thermoelectric coolers are RoHS compliant and qualified by Telcordia GR-468 standard. RMT improved thermoelectric material provides high performance and low power consumption in final application. The ML07 Series has been specially designed for cooling and thermostabilization of laser diodes in telecom applications. Solutions on AlN ceramics are recommended for direct mounting of LD on TEC cold ceramics. ML07 Series was developed by RMT as the alternative to standard ML06 Series TECs. 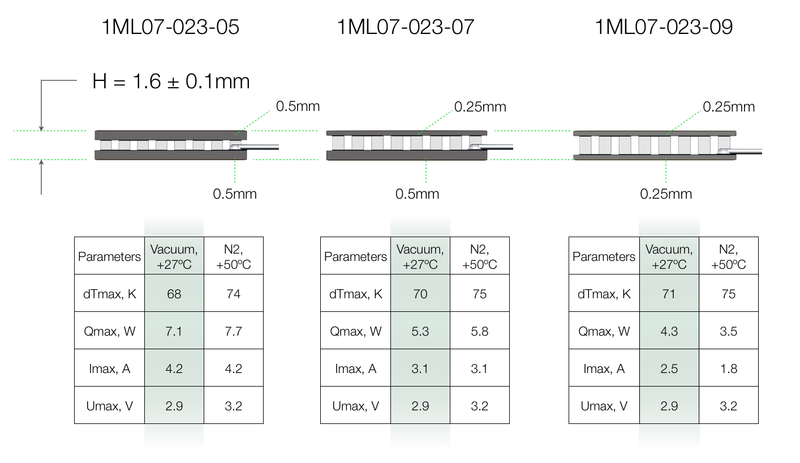 Thermoelectric coolers of ML07 Series have equal dimensions to ML06 TECs, but larger cross-section of internal BiTe elements (posts). Larger cross-section increases TEC cooling capacity, expands dTmax range at working point and may reduce TEC power consumption. Thermoelectric coolers from ML07 Series are recommended for applications with high heatload. The examples above show the difference between ML06 and ML07 TE coolers in performance and power consumption. 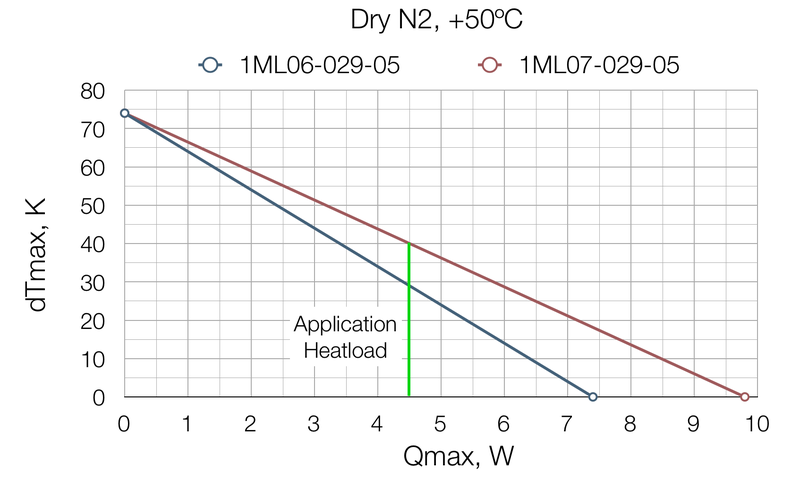 Example 2 shows that 1ML07-029-05 TEC is more optimal under heatload higher than 2W in specified scenarios. Please, use free TECCad software for Windows or iTECPad app for iPad for detailed estimations at your particular application conditions. Thermoelectric coolers from ML07 Series are based on RMT regular assembly technology with up to 14W/cm2 cooling power density. Thermoelectric coolers may have regular wires or WB terminal connection type. RMT Ltd provide a wide range of manufacturing options for the most optimal integrating into final application. 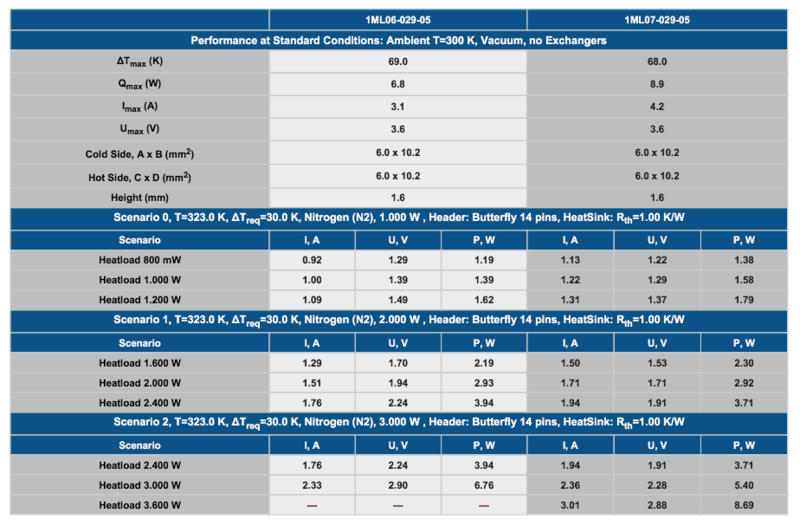 The table below contains all standard thermoelectric coolers from ML07 Series with performance values specified at +27ºC Vacuum and +50ºC Dry N2 conditions.